The Deco Bottle Mini introduces the advanced recreational diver to the use of a deco bottle bottle. Proper handling of deco bottles during a dive is critical so the diver will develop the skills necessary to use and manage a deco bottle. This class presumes the student has completed Recreational 2 or equivalent. 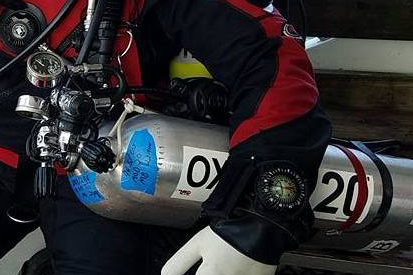 This class is a no-decompression class and does not teach the student how to conduct decompression dives but it does teach the student how to properly handle decompression gas (Oxygen only). The class focuses on cultivating the proper use of a deco bottle to including rigging, gas management with a deco bottle, gas switching, bottle passing, and emergency procedures involving the deco bottle.